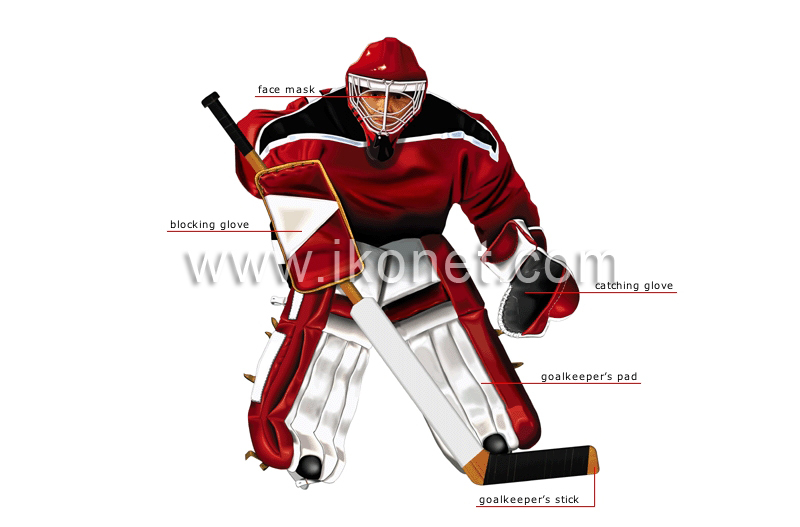 Player whose role is to prevent the puck from entering the goal; the goalkeeper, who faces shots reaching speeds of 150 km/h, wears heavy protective equipment. Heavily padded piece of equipment that protects the goalkeeper’s legs, knees and thighs from the impact of shots. Basket-shaped glove that is closed by pinching the hand; the goalkeeper uses it to catch and immobilize the puck. Cage attached to the helmet to protect the goalkeeper’s face and head; a flexible throat protector is attached to it. Glove mounted with a hard flat rectangular piece that is used to block shots.